Alex Bates won the East Midlands Winter League practice match. The final round of the East Midland Winter League is coming up this weekend on five sections on Factory Bank and another five over on the Old Nene at Benwick. After a brief respite from the winter weather it is due to return with a vengeance in the next day or two so all the big nets of fish we saw in the practice match may well bear little relevance to catches we can expect this weekend. Leading the way from peg one in the practice match from the Benwick village section was Alex Bates. He caught a fine 20lb 15oz net of roach, skimmers and perch on the pole with pinkie, an outstanding weight considering the conditions. In second place was Alistair Ogilvie, who drew peg five on Factory Bank and put 14lb 14oz to the scales, again all small fish. Dave Tebutt was third on 14lb 12oz followed by Richard Martin with 14lb 10oz. Usually weights start to drop away after the leading results but nearly every section was won with a double-figure weight, very good fishing indeed by any starndard. You really can’t blame Ramsey & District Angling Society for going back each week to the piece of the Old Nene at Ramsey St Mary’s while its in such great form. 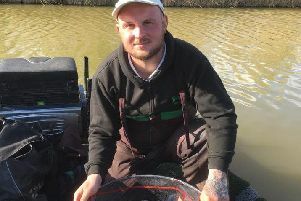 In the midweek open match it was Ivan Steels taking the honours with 19lb 3oz from peg six. He fished pinkie on the whip before switching to the pole with hempseed - a decision which gave him the edge over the chasing pack as he caught a better stamp of fish on seed in the final hour. Runner-up was Malc Hobbs on peg four with a 13lb 12oz net of small roach and rudd, then came Malc Sansome with 11lb 6oz. Paul Kilby won the Sunday club match on the same venue. He drew peg four and fished the whip and waggler with maggot for 18lb 6oz. The consistent Ivan Steels came in second with 15lb 15oz, again catching on hempseed. In third place was Dave Norville on 14lb 12oz. The Ramsey club are also heavily involved with the predator side of our sport running several Angling Trust Pike Qualifiers throughout the season. Their latest pike match was fished on Forty Foot Drain on The Narrows section. Top rod with two good fish weighing 16lb was Terry Jolly. In second place also with a brace was Paul Keepin with 12lb 14oz, then came Enzo Serino with one fish weighing 10lb 8oz. Yaxley, Farcet, Holme and District AC fished their latest points match at Haddon Lodge with Paul Marriott taking the honours in what turned out to be a hard match. After trying various methods, Marriott opted for a small feeder fished tight to the far bank and managed to get three carp for 9lb 8oz all taken on red maggot. Steve Fox was second, fishing a bomb to the far bank for 3lb 1 oz, then came John Ayres with a level 3lb. Those fishing the Tydd Gote matches have once again seen some fine weights recorded. In the midweek match on the North Level Drain Andrew Kilby won from peg four with 11lb 10oz of small fish. Then came Sammy McSpadden on 8lb 10oz, followed by John Taylor with 8lb 2oz.